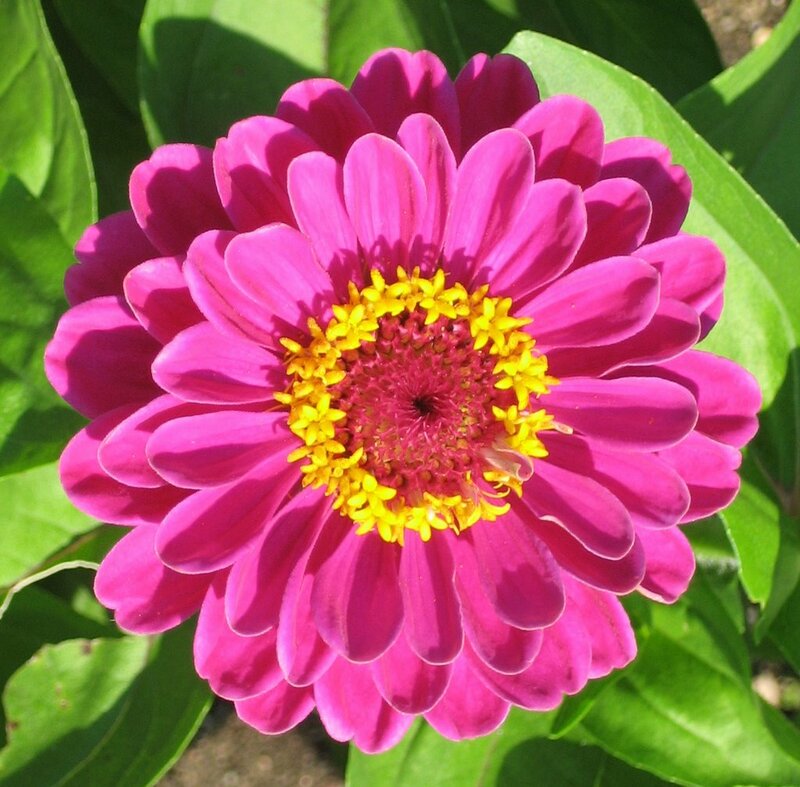 This is one of the first zinnia flowers. Normally, the Japanese beetles start eating these about the time they flower, but not this year. How wonderful! Perhaps they just didn't find them, tucked in the back of the raised bed garden? We had some rain yesterday and more should arrive any minute now. Actually, the weathermen reported that yesterday was the wettest day of the year so far. So, I put out of my mind any idea of trimming and mowing the lawn today. However, I put to use two lessons I've learned in gardening and got it done today, anyway. The first lesson is not to wait for ideal conditions. There is no such thing. Today was cloudy, and humid, and there were probably some areas of the lawn that might still be soft from all the rain. Hardly ideal for mowing. However, I figured it would be a lot better to mow today than this coming weekend, when temperatures are supposed to be 90 degrees or higher. The second lesson in gardening is to not let the threat of rain keep you from getting started on any task. I trimmed and mowed with cloudy skies and the threat of rain the whole time. I started to see a few sprinkles as I was finishing up, but I never got wet, other than from my own sweat. I've been done for an hour or more, and it still isn't raining. If I had waited, I would still be waiting! I did sneak a few looks at the weather radar, so it's not as if I just defied the weather. The corn is tasseling. Okay, I'm going to admit that I don't know much about growing corn. My dad didn't grow any in his garden and I didn't take that kind of agronomy course in college. (Yes, I did take a couple of agronomy related courses in college, but I won't go into that now. I'll save that for someday when there is absolutely no other garden related items to write about.) My concern is that I see that the corn is tasseling, but I don't see any ears forming, and I think that I should. Anyone have any advice? I picked the first cucumbers today. They are so good and sweet right from the garden. They bear almost no resemblance to what is sold in the grocery stores as "cucumbers". I immediately sampled some. Delicious! I picked some more green beans, just enough to cook vs. eat raw. And, I've got two more zucchini squash to cook and eat. The next vegetable to harvest will probably be the banana peppers. I'll give most of these away, because I am not a big "pepper" person. There are dozens of green tomatoes, but none look close to ripening. I would guess I have a few more weeks to wait for a ripe tomato. I am always a little embarrased at how late my first tomato is, and feel like I should have some sooner, but I never do, regardless of the variety. Any advice, other than 'start them earlier inside'? I just love the pictures of your garden. You grow beautiful plants! I just has some fresh beans from my garden too, and there were terrific. Don't worry about your tomatoes, mine are just starting to ripen too and I'm here in CA. My blog is there too, and aslo on the voices.gardenweb.com site. No strings attached, just fun! Hope you can enter. Keep up the beautiful gardening! Why do you grow peppers if you don't really like them? There are so many things to grow, I would plant things I like. Are you sure this isn't my zenia?